Last page of Sarah Jackson's letter. HCP Collection. You will doubtful be surprised on receiving a letter from me, but as Emory was not here to answer your excellent and welcome letter of Aug. 25th, I thought I would take the responsibility of doing so myself. I shall, however, forward your letter to him as soon as I get his address. 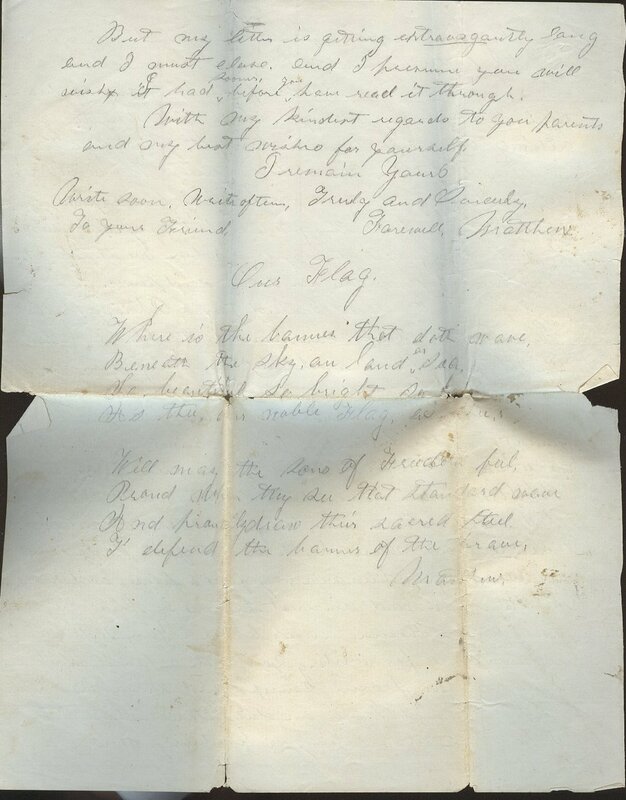 I presume you have, ere this, received a letter from him, written the day before he left home, stating that he enlisted in the army with Sammy [Baird’s brother] and a host of others of your acquaintance. They enlisted in an independent company of Cavalry called the Battle Creek Squadron of Light Horse. We received a letter from him last week, but they only arrived there the night before and he did not know what his address would be. They were at St. Louis then. But two of those that enlisted with Emory, fled; deserted before going into service. Their names I presume you are familiar with Dewitt Keyes and Alonzo Gilbert. The latter was a clerk at Bownes store at Hickory Corners. The officers have been after them twice. They had quite a time with the old man Keyes the last time they came. I suppose the opposition of his family was the cause of Dewitt’s desertion, for they made a great fuss after they found out that he had enlisted. But I would much rather one of my friends should fall at the first charge of the enemy, know that he died in the service of his country, that to have him hunted like a wild beat, skulking around to avoid justice, and at last, perhaps, be shot as a deserter. O, what an awful thing is war. Devastating our bright and beautiful country, causing the best blood of our nation to be spilt, destroying the youth and flower of our land, and making thousands and thousands of hearts and homes desolate. What a sacrifice! But sacrifices must be made, even though it be to unworthy gods; and in order to maintain our homes and enjoy the blessings of a free country, we must sacrifice to the god of Ambition. But we know that the God we worship, the Lord over all, doeth all things well, and he will surely give victory on the side of right, and we trust our cause is a righteous one. Brother Hoyt and his wife left here this morning. He preached his last sermon for the year at the Doud school house on Sunday, and expected to preach at the Bunnell school-house last night, but a heavy rain prevented. Br. Hale preached his farewell sermon last Friday evening, but I did not hear it, as I was unable to attend. Your Fathers people are well I believe, I enjoy the society of your cousin Eliza very well. Your Uncle I think intends returning to Washington soon. There was a flag raising at C. B. Dickerson’s last Saturday, but not a very large attendance, as it was not very extensively known that there was to be one raised. A young lawyer from Hastings, named Allen, made a speech on the secession. But for want of space I shall be obliged to close this scrawl. 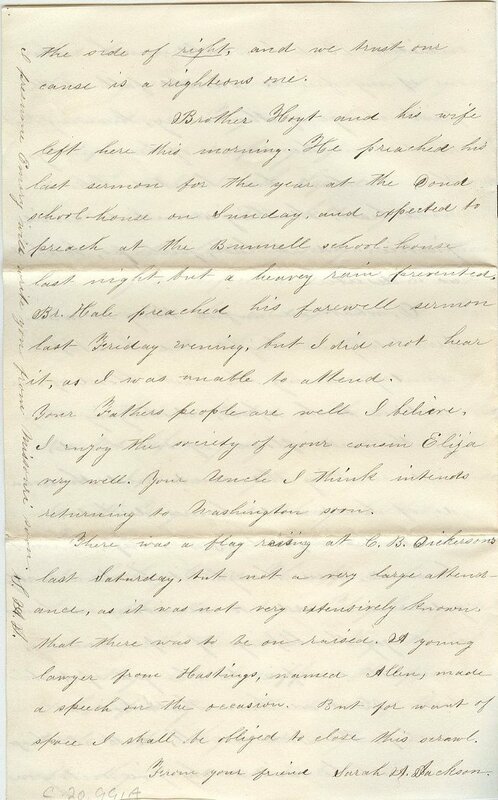 Sarah A. Jackson was the older sister of Emory Jackson (who was the youngest of five) and would have been approximately 30 years of age at the time this letter was written. Last page of Baird's letter with poem "Our Flag". HCP Collection. In Baird’s own words, this letter is “extravagantly long”, containing details of picket duty and interesting gossip from home. We unfortunately do not know to whom the letter was written, but we do have an indication of Baird’s sense of humor for the first time. The photo to the right contains the text of the poem found at the end of this 6 page, over 1,000 word letter all written in pencil (for which Baird apologizes)! I received you kind letter of Sept 1st last evening, but have been detained from answering it till this morning on account of our Company being detailed for picket guard, and as a matter of course I had to accompany it. Pickets are used for the purpose of giving warning to the camp in case of the approach of an army to begin an attack. This is a very particular duty and has thus far in this war proved to be a very dangerous one. A great many have been killed on both sides by pickets firing at each other. Company E has been detailed for this duty almost exclusively for the last few weeks. So you see, I have had some experience in this part of war. One day and night last week, I was on a post within full view of a rebel fort on Munson’s Hill (it is about three fourths of a mile from where I stood.) and about five miles from Washington city on the road to Manassas. This fort occupies a beautiful and commanding site, and to every appearance from where I was, might be made a very formidable place. Sunday and Monday, the 8th and 9th, I was on a post so near the rebel pickets, we could hear them talk, and in part their pickets and ours did get to talking with each other in rather a rough sort of way. Many harsh words passed between them, and they often answered each other by discharging their muskets back and forth. Monday morning the firing grew so warm that the rebels threw several shot and shell from the fort at our pickets, however without any harm. For my part, I have not had the privilege of firing at a single secesh yet, nor can I say that I realy desire to. The two armies have now agreed to cease firing at each others pickets. There are from three to six men on a post. But now I must tell you something about the post I occupy at present. It is about three miles west of our camp on the railroad running from Alexandria to Vienna. I have two comrades with me. We have a little bough house to protect us from the sun. Behind us is a thick deep forest into whose shades the strongest eye would not penetrate at night. Before us is the railroad with its winding [illegible] running through sunny fields, and shady groves, now along some steep hillside. Now through a tiny vale, then it plunges into a deep cut where it is lost to view. Just below the railroad is a deep ravine through which courses a pleasant little stream overhung with huge rocks and towering forest trees. And here as it passes along unheeded by the desolating hand of war and untainted by treasons foul breath. As it rushes over heavy boulders, or along smooth pebly banks, or plunges and foams at the foot of a steep precipice, and then dashes on through the [illegible] shade of a wide spreading tree, whose ample and luxuriant branches reach far over the mossy banks and then playfuly murmurs out into the broad sunlight, it ever sings all its course the songs that were sung by our grandsires, the sounds of liberty. And I have no doubt if it had a human voice it would cause the surrounding hills to resound with the music of the Star Spangled Banner, or with the thrilling notes of Hail Columbia. At least it would not lend a voice to the traitors cause, nor whisper one word of comfort to its disunion in its expiring hour. And in this beautiful spot we are to spend the day. We expect to be relieved at night. But I must say a little about home matters. 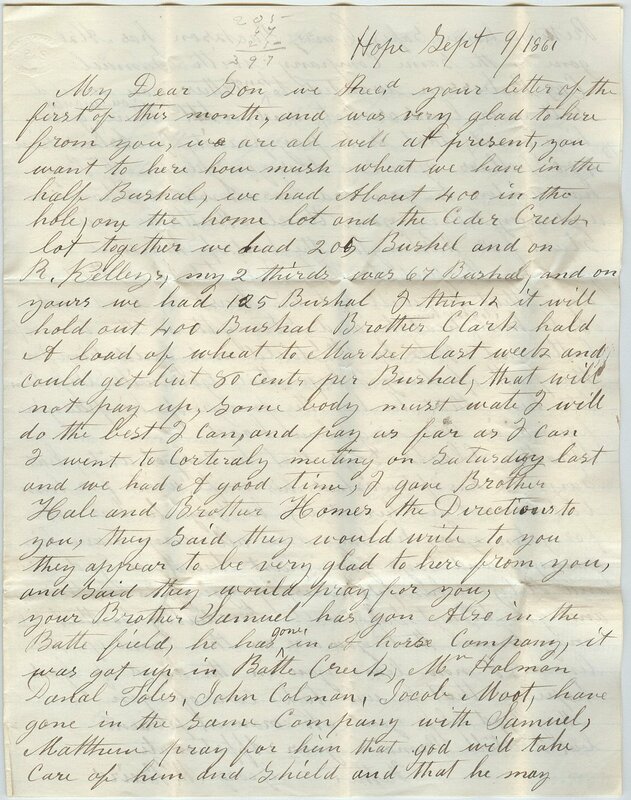 I received a letter from home a few days ago and they stated that brother Samuel [sibling] had enlisted in the cavalry company at Battle Creek and was expecting to go to Missouri to join Gen Fremonts command. I will give you a list of the names of those that enlisted (in the same company) and with whom you are acquainted. Emery Jackson, Mr Holman, De Witt Keyes, Daniel Toles, Elanzo Gilbert, Jacob Mott, and Sam’l Baird. They stated too that Mary [sibling] had broken one of her arms. There appears to be several out and out rebels down in Barry [County] and they don’t carry any colors to disguise it either. Secession seems to be quite a prominent theme with them, and certain young ladies, say they hope every northern boy that goes south to fight will get shot. Patriotic young ladies, They have a small thimble full of humanity and a considerable loss of common sense. I have never written to Noah yet but I think I shall if I have time, but I suppose you often write to him. So if I do not get time to write, you will please give him my best respects, and tell him I would be happy to hear from him, and also give him my address. I saw Aaron’s wife last winter, I think he married her out of pure love, for she is not much handsomer than myself, which you of course know does not excel, but she is spoken of by every one as an excelent girl. But I am realy sorry the widow Polly is married, for I shall miss a good chance then won’t I? But never mind she’ll get tired of him after awhile. You will please remember me to Jackson Russell, tell him I said my best respects to himself and wide from the battle ground of Virginia. You spoke of its being such a beautiful Fall morning, when you wrote, but everything retains the hue of summer here yet. Scarcely a leaf is turned to show the change of season. The weather is beautiful and warm. We have been expecting a battle here for a long while, but everything seems to move slowly. Yet it may come when we think not, like an avalanche, terable in form and power. Enlcosed I send you a photograph of General McClelan commanding the Army of the Potamac. He is a shrewd, far seeing man and [two words obscured by tear] with all, and under him we may hope to subdue secession and restore peace and tranquility to the Union. Words cannot express my grattitude to you for the kind wishes you express in my behalf. While there are some who would desire that evil might befall those who have gone to fight for their country there are others whose hearts are not quite so calloused in whose sympathies we may find a place, and whose kindest wishes and sincerest prayers we know are ascending to Heaven in our behalf. You will please excuse me for writing you in pencil, but I am so far from camp and have no ink with me and I am on duty so constant that I have to write whenever an opportunity offers. But my letter is getting extravagantly long and I must close and I presume you will wish I had sooner before you have read it through. With my kindest regards to you parents and my best wishes for yourself. Proud when they see that standard above? I have just brought your letter of Sep 1st to your father from Bristols and am now seated at your father’s table to write. The people here are all well. The letter you wrote to Tommy and Lucy has been received, also the one to Emery Jackson, but not until after Emery had left for the war. Well, I have some news to tell you if you have not received it from any other source. Last week Samuel, Emery, Daniel Tolles, & Dewitt Keyes enlisted in a cavalry company formed at B Creek, [Battle Creek, MI] (Capt Rogers) 7 left for Missouri on Wednesday Dewitt Keyes deserted and has fled into Canada, as is supposed. Poor Dewitt! I pity his foolishness! I would have gone, had I enlisted thought I know I should have been shot the next day. Your people threshed a few days ago. They had over 400 bushels of wheat counting yours which reached 125 bushels. I am boarding yet at Mr Jackson’s & trying to get in wheat on my farm. I don’t know what I shall do after that. My front teeth are gone and they will not on that account, receive me as a volunteer. Probably I shall settle somewhere in the practice of the Law. I am glad to see the commendable spirit you manifest in the service of your country & I hope God will protect you in his kind keeping & that you may soon return in good health with trophies of victory from the war But what the end will be we know not. The rebels appear strong in every part of the country. I fear Fremont will have serious trouble in Missouri & that civil war will yet break out in Kentucky. I hope still that better things are in store for this Government & that this rebellion may be put down. We have a rumor here that Jeff Daws is dead but it is not generally credited. The Stove–pipe story had reached us in the papers before your letter came. Aaron Bunnell was married to Jennie Lewis a short time since & Sarah is possibly to have her dream of “marrying a minister” realized. A young minister named Gray, has been stopping there at her fathers sometime. Her folks think she has [s]mittened “Jeff” though I doubt it And if she has, she will regret it in my opinion. How changed are my circumstances from what they were two years ago. I cannot fee[l] reconciled as yet to this terrible change, though I ought to be, no doubt. The forest trees begin to put on the appearance of the “lean & yellow leaf” The farmers are busy getting in wheat. But I must close. Write me if convenient and remember as one of your sincerest friends. Owin L. Raymond or O.L Ray as he writes here, lived near to Baird’s family in Cedar Creek. He married Mary Wagoner in 1864 and is listed as a farmer in the 1870 census. Ray makes the first introduction to Baird’s family members, his father George and siblings, Samuel, Tommy and Lucy. Later posts will reveal more of their stories. 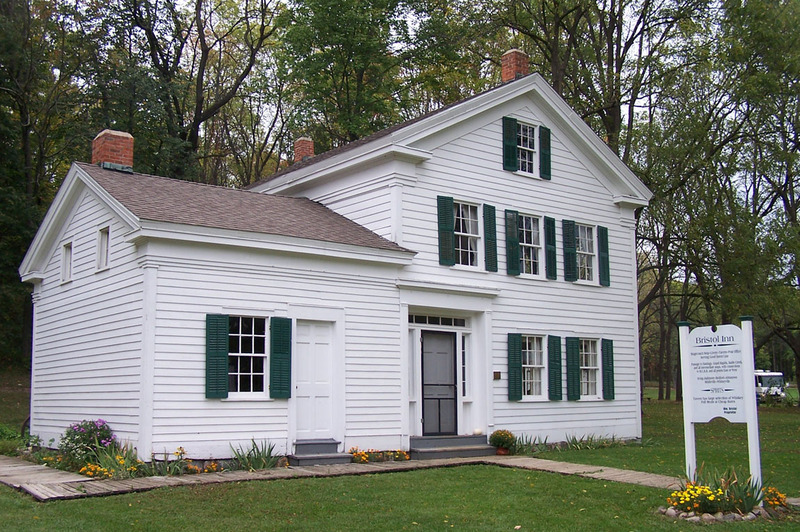 He also mentions picking Baird’s letter up at “Bristols”, a stagecoach stop, post office, tavern and inn, which was located near Bristol Lake in Dowling, MI. Bristol ran his stop only until about 1862 when the liquor taxes became too high and a competing stopping place was built up the road. 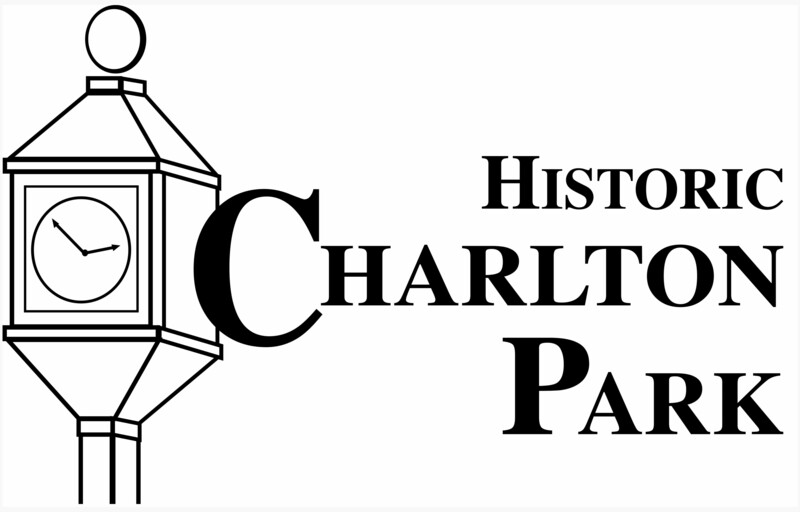 Today, Bristol’s Inn can be found here at Historic Charlton Park and is in frequent use by school children and visitors, to see the building’s interior, click here. Out on picket again. If ever military duty becomes odious and repulsive it is on the Sabbath. But our national difficulties force the painful necessity upon us. Company E was placed a little more in the advance today. Nothing of importance occurred. I was not on duty till night. When with two others I verified a post in what was once a cultivated field, but is now thickly overgrown with thrifty pines, many of which have attained to a considerable size. The night, as the day, passed without anything worthy of remark, except now and then the sharp ring of the sentinels musket far in the advance or the night wind “sighing its soft melody” through the tall pine trees. Today our regiment received the balance of money due it from the State of Michigan. It was a small sum, but money is always welcome to the soldier be it ever so small a sum.